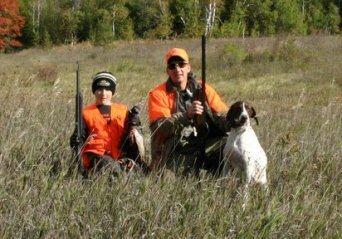 TLC Ranch is your Up North bird-hunting destination offering pheasant, chukars, quail and grouse. Guided and non-guided hunts area available year-round with onsite lodging available. Take advantage of our sport fishing charter service also! Bird Hunting Preserve - Ringneck Pheasants August 15 until December 1. Chukars - early Fall season. Field or European Hunts. Guided hunts, your or our dogs. 1 & 2 party outings. Fishing Northern Lake Huron from Rogers City. Burt , Mullet, Indian River area, Grand & Long Lakes. Thunder Bay, Alpena. Our "ranch house" sleeps 8 - has 3 bedrooms and 2 baths, a large open gathering area, satellite TV and a fully equipped kitchen. Open fall and winter for snowmobiling!